Growing evidence suggests that following this eating pattern may improve memory and prevent neurodegenerative disease. Memory loss often is indicative of the normal aging process, but it also may be a sign of neurodegenerative disease development, namely Alzheimer’s disease, a form of dementia that causes problems with memory, behavior, and thinking, and gradually worsens over time. While there’s no known cure for Alzheimer’s, research suggests that a healthful lifestyle that includes following a Mediterranean pattern of eating and regular physical activity may delay or slow the disease’s progression. An estimated 5.2 million Americans of all ages have Alzheimer’s, including 5 million people aged 65 and older as well as approximately 200,000 who have younger-onset Alzheimer’s. Experts believe that number will increase to 7.1 million by 2025 and nearly triple by 2050. Alzheimer’s is the most frequent type of dementia, adds Miguel A. Martínez-González, MD, PhD, MPH, chair of the department of preventive medicine and public health in the medical school at the University of Navarra in Spain. In addition to memory, it impairs the ability to perform activities of daily living and is characterized by a progressive chronic impairment, he says. The disease can be devastating to patients and their families. Although the reasons aren’t fully understood, there does seem to be a link between a healthful lifestyle and a decrease in cognitive impairment. Recent research has focused more specifically on the positive benefits of the Mediterranean diet and the reduced risk of Alzheimer’s as well as other cognitive functions. Past research has indicated that this diet, high in fruits, vegetables, and unsaturated fatty acids, has been associated with slowing and even preventing the metabolic syndrome, protecting the kidneys, and reducing the risk of other chronic diseases such as heart disease and diabetes and, more specifically, neurodegenerative disease. For example, a meta-analysis published in the October 2013 issue of Annals of Neurology showed that high adherence to a healthful dietary pattern, such as the Mediterranean diet, may be beneficial in the prevention of various conditions linked to the aging brain, including cognitive decline, depression, and stroke. 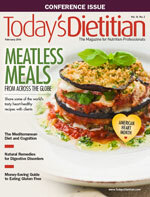 The research team behind the meta-analysis, led by Theodora Psaltopoulou, PhD, of the University of Athens School of Medicine in Greece, found that a Mediterranean diet was protective for both of the study’s subgroups, participants who had mild cognitive decline and those who had advanced cognitive decline, and showed positive effects when looking specifically at Alzheimer’s. Another meta-analysis, published in the July 2013 issue of Epidemiology, also found that greater adherence to a Mediterranean diet was associated with slower cognitive decline and a lower risk of developing Alzheimer’s. The researchers of this meta-analysis suggested that further studies are warranted to clarify a possible association between diet and mild cognitive impairment or vascular dementia, along with long-term randomized controlled trials looking more closely at the possibility of preventing or delaying the onset of Alzheimer’s. Moreover, according to recent research presented at the Society for Neuroscience meeting in November 2013, there was a significant association with slowed decline in executive function (eg, the ability to remember details, switch focus, manage time and attention) at three years’ follow-up among subjects who adhered to a Mediterranean diet. Those who adhered to a Western diet (rich in red meat, processed foods, refined grains, potatoes, and fatty dairy foods) had a significantly increased risk of declines in visuospatial functioning, the ability to process and interpret visual information about where objects are in space, at three years’ follow-up. While there’s research suggesting there are many positive benefits associated with following a Mediterranean diet, the reason why this diet may lead to better brain health remains uncertain, although many theories exist. Researchers and dietitians tend to agree that consuming a diet that’s primarily plant based, focused on real and whole foods, and devoid of processed foods and red meat has much to do with its positive effects on cognitive health. In addition, research on the brain has indicated that chronic inflammation is a factor in Alzheimer’s development, and therefore the anti-inflammatory effects of the Mediterranean diet are surmised to be a possible reason behind improved cognitive function. “Some components present in fruits, vegetables, nuts, red wine, and virgin olive oil are able to exert potent anti-inflammatory effects,” Martínez-González says. As your clients and patients begin to adopt practices of the Mediterranean diet, they may find it’s easier to do than they once thought. To help them make a commitment, Nolan Cohn tells patients to choose two days each week for fish dinners and stick with them. Because fish doesn’t have as long a shelf life like other protein products, she suggests that “fish night” be within a day or two of grocery shopping. Salge Blake says offering patients recipes is one of the best ways to set them up for success. And research seems to indicate that an educated patient is a successful one. Martínez-González says that after 6 1/2 years of follow-up with more than 500 patients in the PREDIMED-NAVARRA randomized trial, the groups who were educated about the Mediterranean diet had significantly better cognitive abilities than those who didn’t receive the education.